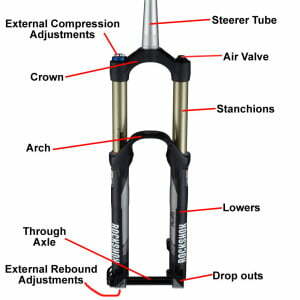 This post explains bicycle fork types and basic terms. 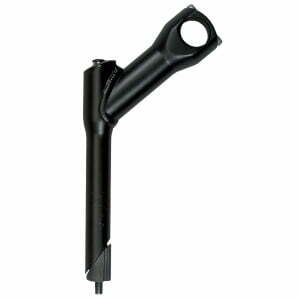 A separate post explains the names of bicycle fork and headset bearing parts. 1. What is a bicycle fork? Bicycle fork is a part of the bicycle on which the front wheel is mounted and which is turned via handlebars in order to steer the bicycle. 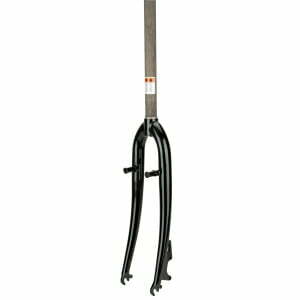 It consists of steerer tube, crown and fork legs and dropout for receiving wheel axle. It usually has brake mounts as well. The point where the steerer tube and the crown connect is the point up to which the fork is inside the frame. The part below that intersection is visible. 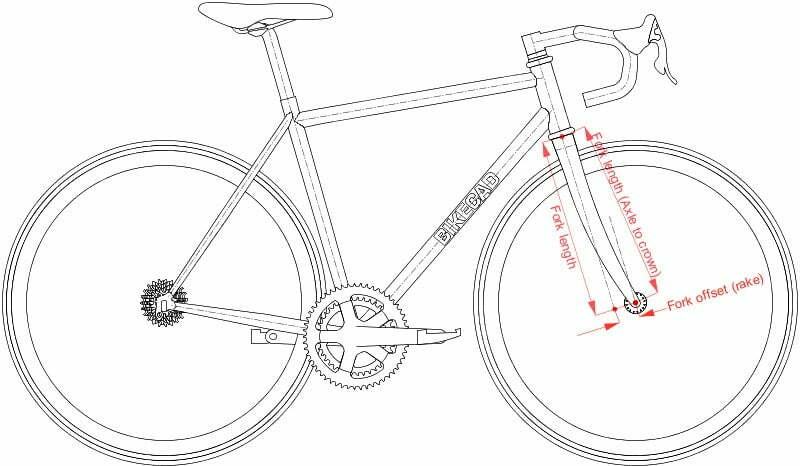 Steerer tube length – for big frames, or when looking for a more upright seating position, with higher handlebars, it is important to have a long steerer tube. 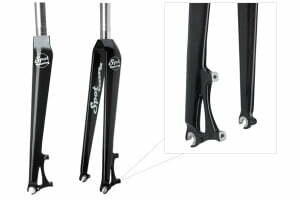 Fork legs length, or to be more precise, the length between the crown-steerer intersection, to the dropout. Axle to crown. Important to determine the wheel size which the fork is made for. 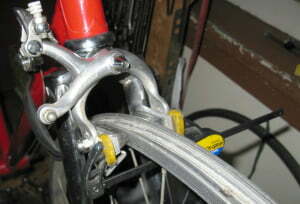 Rake affects handling, in a way explained in the post about bicycle frame geometry. 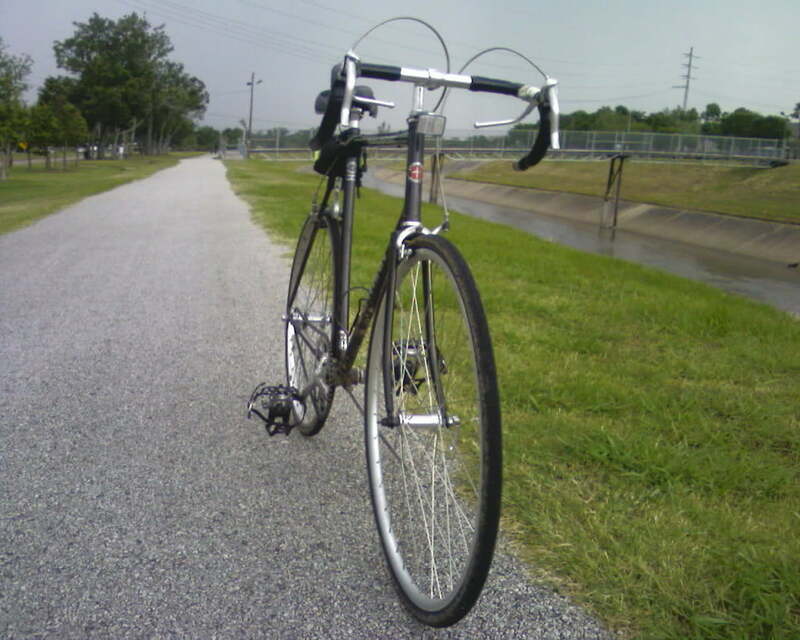 There are several types of bicycle forks. Two standards of fork attachment, three standards for brake attachment. Also, there are forks with shock absorbers and stiff forks without any springs. 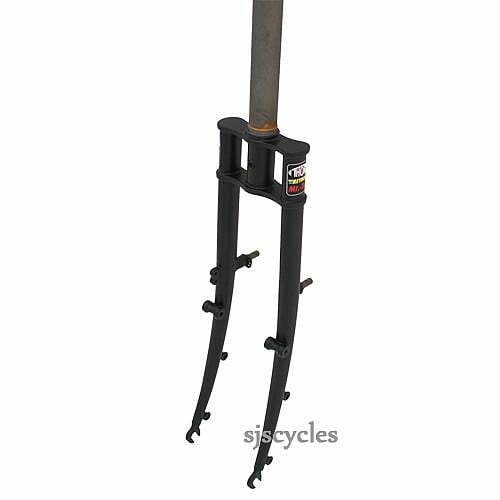 So, when choosing a bicycle fork, apart from the size which is needed (kids bike, big bike, MTB etc), it is important to know: how it’s mounted, which brake mounts it has, is it suspension fork. It has threads cut into the steerer tube. It is held in place with a nut screwed onto the steerer tube. The nut is held in place with another nut – locknut. The advantage of this system is that handlebar height can easily be adjusted – one bolt is unscrewed and the handlebars are moved up and down. It is inserted into the fork. It is held in place with a quill system. Fastening the bolt on top moves the quill sideways, pressing it onto the inside walls of the fork. The greatest flaw of this system is that the bars are held in place with a quill and one bolt. In one place. Moisture gets in, it can rust, then it can get stuck. It can also rust a lot and get loose without any warning. The stem is held just at the place of the quill – the top part of the fork just prevents the stem from moving left-right, but it doesn’t hold it tight in place. Threadless fork. Also known under registered trademark “Aheadset”, or just “Ahead” short. Fork is put into the frame, then stem and spacers are stacked to cover the protruding steering tube. Then at the top there is a cap with a bolt that is fastened to preload steerer bearings. 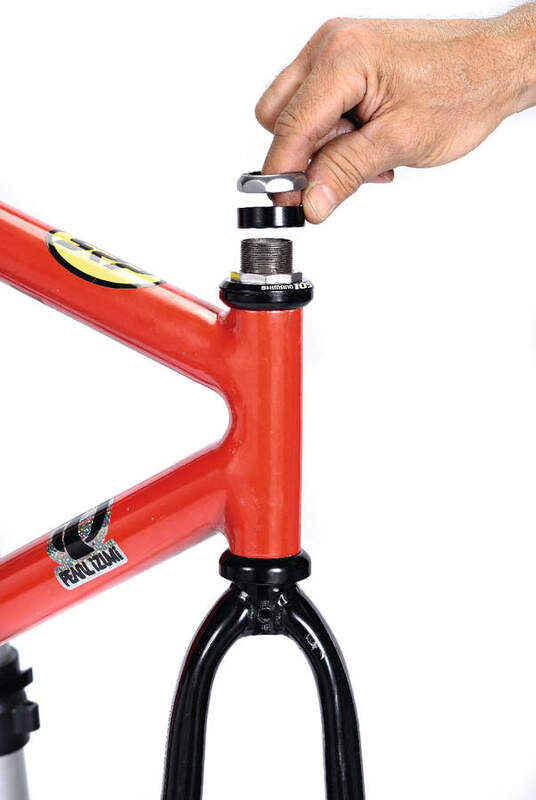 After the preload is set, the fork is held in place by tightening stem bolts – usually two. This system allows for one bolt to snap and it is all still safe and works well. It also holds the stem much more securely and firmly. 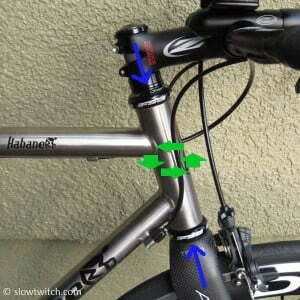 Mounting system popular with older bicycles and (with slight mounting nut variations) with modern road bikes. Fork compatible with this system has a hole for mounting the brake drilled. Also, the hole is up to 6 cm away from the rim, so that brake calipers can reach the rim. 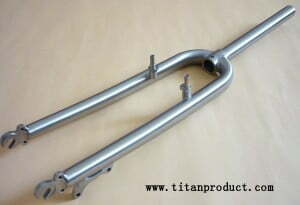 With this kind of forks, it is important to know for what wheel size they are made. In case a smaller wheel is used, brake calipers might not reach the rim. In case a larger wheel is put, it might not fit at all. 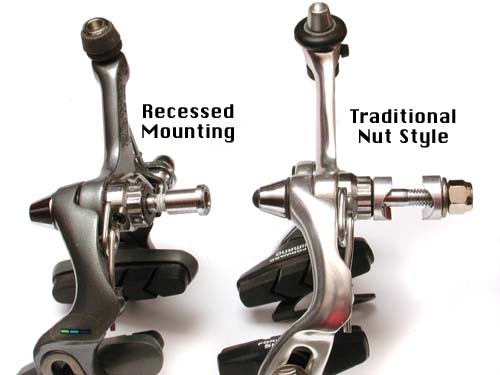 On the left is a modern style brake, with holding nut going into the recessed side of the fork. On the right is the old caliper type, with a longer bolt, and nut fastening on the outside of the fork. Brakes are fastened to fork mounts. Brakes mounted on fork mounts are usually of cantilever, or V-brake type. Cantilever brakes require frame mounted brake cable stops above brake calipers as well as fork mounts (detailed about that in a separate article). Two pointy axles on which brake calipers are screwed onto. Many of such forks have a hole drilled in the middle. Through that hole, a bolt can be put for holding mudguard, or for attaching brake mounted at the fork centre. 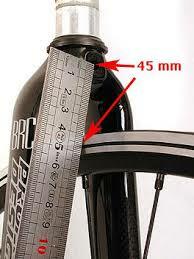 Here it is also important to make sure that fork is used with appropriate size of wheels. Fork for 28″ wheels can take 26″ wheels, but in that case brakes will be placed too high in that case and won’t be able to catch the rims of the smaller wheel. Disc brakes are mounted on the left hand side of the wheels, so the left fork leg has mounts for disc brake caliper fastening. 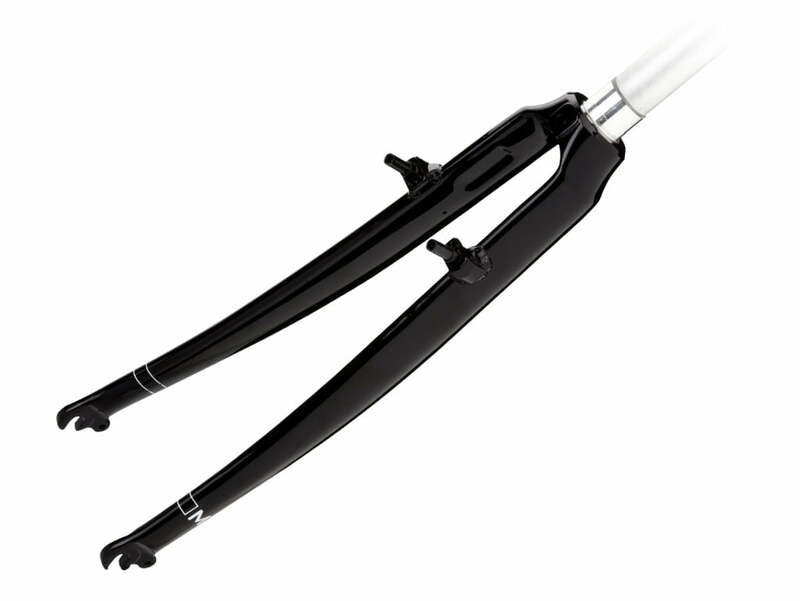 These forks can also have drilled hole in the middle for “ordinary” brakes, or mudguard mounting. They can also have V-brake mounts. Fork with mounts for all the three brake caliper mounting standards. Here combining different sized wheels is OK, because disc brakes don’t use rims as braking surface. However, using a small fork with too big a wheel can be a problem – it might not fit. 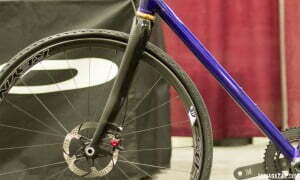 Rigid fork concept is clear – metal fork of appropriate length for wheels it is made for. Amount of fork travel – usually between 6 and 20 cm. Possibility of adjusting preload, compression damping and rebound rate. Suspension forks compress when the front wheel hits a bump, then moving slowly back into previous position. They extend to a degree when a wheel reaches a small hole in the road. Doing this, good quality suspension forks improve front wheel traction and make the ride more comfortable. Theri downside is greater weight and need for maintenance. For most riding conditions and styles, enough dampening can be achieved just using fatter tyres. Suspension forks are generally longer than rigid forks. Because of travel, in order to prevent the crown from hitting the tyre, suspension forks need to be longer. If a bicycle frame is made for (longer) suspension fork, and for any reason, one wants to switch to a rigid fork, regular rigid for will be too short. 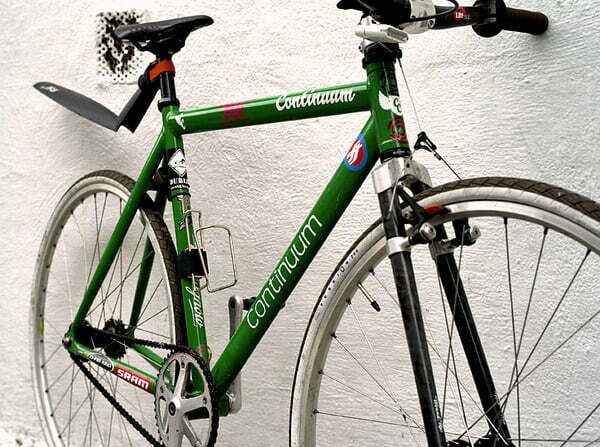 Too short fork will ruin the bicycle’s frame geometry, making steering too twitchy. That is why suspension corrected rigid forks were introduced. They have axle to crown dimension about 10 cm longer than a standard rigid fork. They often look like regular forks, just fork legs are longer.